Preserving pottery, a traditional craft of Crete with roots in 7000 BC, while developing it so as to serve the modern decorative and utility needs, Michalis Houlakis is engaged in this art more than 25 years. 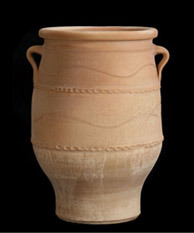 Designs of ceramic pots that were found in archaeological sites of the Minoan period are included in his selection: Knossos, Pithari, Pithos, Koronios, Minoiko, Mpogiatzopitharo, Brika, Amphoreas. Still handmade, shaped on pottery wheels and wood fired in kilns burnt with olive seeds, his pots and planters are characterized by the unique aesthetic of Greek pottery of Thrapsano. With new designs he is trying to serve the needs of modern homes and gardens: Munich, Electra, Icarus, Panos, Voni, Spiros. 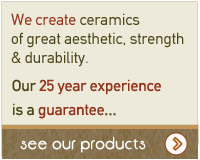 Extra care is taken for the strength and longevity of the ceramics with the use of anti-frost and water-proof materials. With respect to the environment, natural and environmentally-friendly water-based materials are exclusively used in our "handmade pottery for sale". 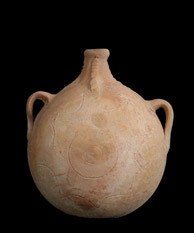 The first archaeological discoveries date to 7000 BC, yet pottery thrived initially in the Early Minoan period (3000-2100 BC) and came to its peak in the Middle Minoan period (2100-1600 BC). Making pots water and frost-proof requires a special technique, based on chemical nanotechnology. It protects them for a long time from erosion and turning green due to moisture while it prevents moss, lichens and salts. For this synthesis you will need 3 of the same planters in different sizes. Fill the largest planter with soil almost to the lip. Then place the middle sized planter in the centre of the largest planter. Traditional use:Container for cereals and pressed grapes (keeping pressed grapes for a period of time is one of the steps to make wine or raki). Traditional use: People used it as a container where they carried a little amount of wine or water. They tied a rope from the two holders, so that they could hang it. 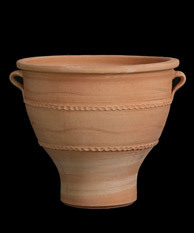 It is the typical piece of pottery of Thrapsano. Traditional use: Container where people stored olive oil, cereals, cheese, rusk (dried bread).